Looking for a great gift for a toddler? Plan Toys has an amazing selection of Eco-friendly wooden toys and today we would like to introduce you to one of them - Tori, a little horse that rocks! Not only will your toddler love rocking on it, your worries about large toys taking over the house can be eased because it is compact and easily folds for storage. The Plan Toys Tori Rocking Horse is a high quality wooden toy that is designed to last for generations. The genius design makes it really easy to hide when you have company over or when your children outgrow it, then grandchildren can discover it all over again! The gender neutral design blends in seamlessly in any decor. An open ended toy like Tori will have your kids' imagination running wild through castles, battle fields, circuses, and far away lands. You can read the full review of the Plan Toys Tori Rocking Horse over at Eco-Babyz and see detailed photos as well as a short video! Purchase: The Plan Toys Tori Rocking Horse retails for $99.99, you can purchase it on Amazon ($89.95 with free shipping). You may also purchase on the Plan Toys website. Win One! Plan Toys is blessing one of you with a folding Tori Rocking Horse for your little one. Special thanks to Eco-Babyz and So Easy Being Green for hosting this giveaway. Huge thanks to all participating bloggers as well! Giveaway ends December 11th at 12:01 am, open to US residents, ages 18+. To enter please use the Rafflecopter form below. Thank you! Disclaimer: I received no compensation for this publication. 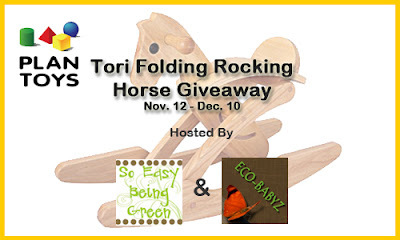 Eco-Babyz, So Easy Being Green, and Plan Toys Tori Rocking Horse Giveaway Event bloggers are not responsible for sponsor prize shipment. I love the Play House. We love the play house! Oh my goodness, I LOVE wooden toys. I love all of it! I love the green dollhouse with furniture! Can't beat wooden toys! I love the baby walker and the geometric shape sorter. I love the Tori rocking horse! Love that it folds up. Also love all the quality play food. 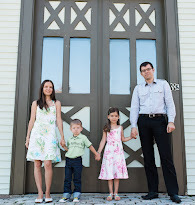 Oooh, the playhouse is adorable! i love this rocking horse! it has been on our wish list for some time now.